Babu Guda, Ph.D., will be collaborating with Kenneth Cowan, M.D., Ph.D., director of the Fred & Pamela Buffett Cancer Center on the Watson project. UNMC and IBM have signed a letter of intent to collaborate on genomic research and analytics. Researchers will use the IBM Watson Genomic Analytics solution, which uses DNA changes in the sequenced tumor samples and large quantities of medical literature to identify relevant mutations and potential drugs that a clinician can consider in a treatment regime -- all based on the patient's genomic profile and the specific mutations. "They have fed millions of research articles into the program, including biomedical research and clinical information. The computer uses an algorithm that can keep track of the complex relationships among gene mutations, drug treatments and the treatment outcomes." UNMC will get access to an early version of the Watson Genomic Analytics solution from IBM, to conduct early testing and provide feedback. "Jeopardy" fans may remember the Watson computer from its 2011 competition with former champions Ken Jennings and Brad Rutter, in which the computer won decisively. 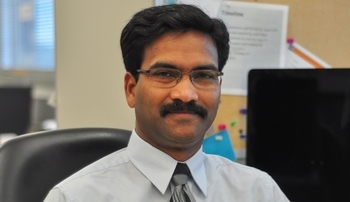 "After that, IBM started looking at applying this technology to health care," said Babu Guda, Ph.D., who will be collaborating with Kenneth Cowan, M.D., Ph.D., director of the Fred & Pamela Buffett Cancer Center, to analyze cancer tumor genomes during the Watson project. UNMC researchers will feed the gene mutations from a single human being into the program, and based on that information, it will compute the appropriate treatment options, printing out a report giving optimum solutions. In the current project, Drs. Cowan and Guda and their teams are sequencing the genomes of normal and tumor tissues of the same patient and identifying variations that are specific to the tumor tissues. Tumors can have many mutations, but some -- "driver mutations" -- are critical for the initiation and progression of cancer. "Typically, we get several thousands (of variations)," Dr. Guda said. "Not every change is important -- but some driver mutations or other serious mutations that affect cellular function may give a selective advantage for cancer cells to proliferate and spread the disease to distant locations." After identifying the potentially damaging mutations, the project will attempt to identify the "actionable mutations" -- with significant diagnostic, prognostic and therapeutic implication in therapies -- that can be successfully attacked by treatment strategies. Using information on tumor variations, the Watson checks its database to match variations with previously reported information and treatment outcomes. It produces a suggestive report that physicians can consult before making treatment decisions. The next step of the collaboration will be creating a statement of work, with an IBM site visit planned for February.